This used to be Amelia’s in Teele Square, but the owner got a full liquor license and re-branded the restaurant. However, the menu is still primarily Italian with oddities like fish and chips and steak tips thrown in. There is absolutely nothing that merits the “bistro” title. I had a 6:15 reservation on Saturday, but there was no need, the restaurant was completely empty. Steve and I started with a mixed green salad ($7) and it was huge. The menu does not state that it is for two, but the portion was so large we did not finish it. 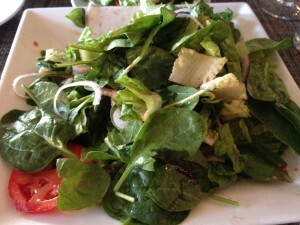 It was lightly dressed with a flavorful balsamic vinaigrette. I was pleased with the large slices of sweet summer tomato. 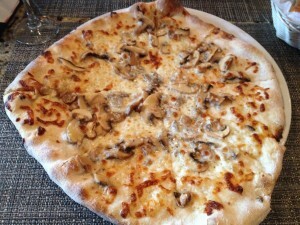 Next was the funghi pizzette, slices of mushroom with fontina, no sauce ($14). The crust was thin and crispy and I liked the toppings. It was pricey for the size, but delicious. 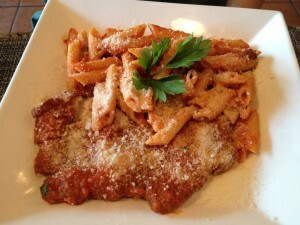 Lastly, we had the chicken parmigiana ($15). It was awful. The breaded cutlet was so dry and mealy, I could not believe they served it. The accompanying penne was fine. It’s really too bad the chicken was so awful; it was dreadful enough to mar an otherwise decent meal. I thought Amelia’s was mediocre and 7 West continues that tradition.